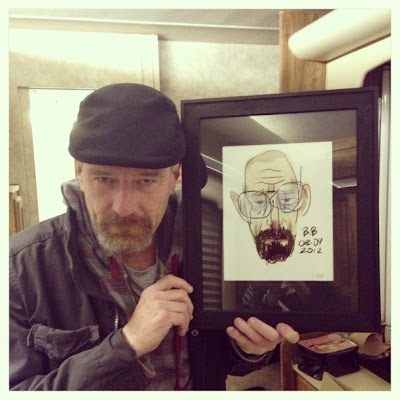 My drawing of 'Mr White' in the hands of Bryan Cranston. That's neat! How did you come to meet Bryan Cranston? I've always thought he had a very cartoonish/expressive face (in a good way). I think it's what makes him such a good actor. Ça a dû être une bien chouette rencontre ! Wow...so awesome. How cool is that??? Now me and Bryan Cranston have something in common - we both have sketches done by your fair hand on our wall! A travers BD, j' ai (re) découvert cet acteur qui a été juste bluffant. Le sketch est très ressemblant !